Your 'à la carte' holidays...Embrace the deep experience of an ultimate retreat! Heritage The Villas... 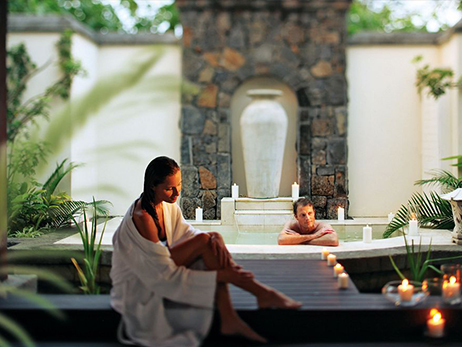 Luxury hideaway in the heart of the unspoilt South of Mauritius. Nestled in the Domaine de Bel Ombre between mountains and pristine lagoon and set in the breathtaking beauty of a nature reserve, those scenic villas offer high end services and privileged access to a 18-hole championship golf course, a 19th century manor house and facilities at two neighbouring deluxe resorts... Paradise found! The tranquil atmosphere and the large open spaces of your villa will quickly make you feel totally at ease. The warm surroundings of the landscaped garden will provide you with a welcome sense of privacy, but you are never far from an extensive range of 5* services - many of which can even be enjoyed in your villa. There are 4 styles of villas - 2 Bedroom Pool Villas, 3 Bedroom Pool Villas & 4 Bedroom Pool Villas - for you to choose from, ranging from spacious 3-bedroom villas to 4-bedroom villas up to 400 sqm. Built with excellent quality finishes, the villas have air-conditioned master bedrooms with en-suite bathrooms, infinity pools, large verandas, state-of-the-art communications, a barbecue area, a gazebo and landscaped tropical gardens. Reading on a long chair under the gazebo or lying next to the large infinity swimming pool while the mouth-watering aromas from the barbecue enchant your senses...this is your time for relaxing! 4 bedroom villa, ground or ground +1 floor - Each bedroom has its own en suite bath/shower room - The master bedroom (2 per 4 bedroom villa) is equipped with a flat screen TV - Ceiling fan + aircon - Dressing - 1 twin bedded room + 2 king size bedded rooms + 1 queen size bedded room. Combination of Adults & Children (minimum 1 adult) + 1 infant. A butler is at your service to do the set up and service, if you are hosting friends or relatives. In the comfort of your villa...Be pampered by a selection of special cares and treatments by Seven Colours Spa in the intimacy of your home. Our spa menu includes treatments for pregnant women, teens and kids. It is a concept and philosophy that can be used in daily life: in the products we use and the food we eat. Seven Colours honours the unique needs of each individual through personalized spa treatments, products & experiences inspired by the natural ambience, culture and healing heritage of Mauritius. These are designed to harmonise body, mind and energy. Just as Millesime may describe an exceptional perfume or wine vintage so the Seven Colours Millesime Collection underpins our most up-market spa category. Exceptional and refined facilities, spa experiences, treatments and wellness oriented services are integrated with the natural environment surrounding them. Inspired by the concept of the Seven Colours Spa, the Energy Cuisine restaurant at Heritage Awali Golf & Spa Resort where the various "colours" menus symbolizing the 7 chakras will enable you to continue your treatment by an innovative culinary experience of the senses. A 5 star service in the heart of a magnificent estate in the south of Mauritius. Heritage Golf Club offers unique conditions for golf! Heritage Golf Club is located in the heart of Domaine de Bel Ombre and offers ideal facilities for vacation to Mauritius, a golfing weekend or a 18 holes round during the week! You can enjoy extraordinary golf conditions. Indeed, this 27-hole (18-hole Championship golf course + 9-hole short course) is part of the Domaine de Bel Ombre which offers accommodation in two hotels, Heritage Le Telfair and Heritage Awali, and in luxury villas, Heritage The Villas. As residents of Heritage Resorts enjoy free unlimited golf during your stay. The Club House offers a huge choice of services: restaurant, bar, mobile catering on the course, fully equipped locker rooms, golf carts, caddies, cleaning of your equipment, an academy for adults and children and a pro shop for your purchases and equipment hire. Fitness fanatics can get their daily fix in the magnificent 600 m² pool and state-of-the-art gym, where a personal trainer* is on hand to give dietary and exercise advice. Group Tai Chi and yoga classes are complimentary. At Timomo & Friends miniclub welcome children aged 2 to 11 years, to a varied programme of activities specially designed for each age group. Personalised babysitting service (with an additional charge) as well as specific equipment and amenities for the little ones are available. The Domaine de Bel Ombre in the South of Mauritius has what it takes to offer families, couples or friends holidays that are tailored to their wishes. A varied choice of accommodation with two top-notch resorts and private luxury villas, 11 restaurants each with its own charm and specialities, a championship golf course, world-class spa facilities, one of the most beautiful nature reserves on the island, a beach with a “hip & chic” atmosphere, a kilometre-long sandy beach as well as a whole range of land and sea activities... All of this in one place! In the south you can visit the Riambel equestrian center near Pomponette. In addition to rides on one of the most pristine beaches of the island, more than 2.5 kilometers long, you will also enjoy the quietness of the place due to the total lack of hotels there. This beach will be yours and only yours. Horses and ponies, beginners and more experienced riders, there is something for everyone’s taste. Experience the religious and cultural aspects of Mauritius by visiting the very renowned “ Ganga Talao” commonly known as Grand Bassin in the Southern part of Mauritius. Grand Bassin is a crater lake which is about 600m feet above sea level with a depth of between 50 and 55 feet. This place is considered as the most sacred place for the Hindus in Mauritius, as it serves as a pilgrimage site in the name of Lord Shiva (a Hindu deity). Its sanctity is described as having a close connection to the sacred Ganga River in India. 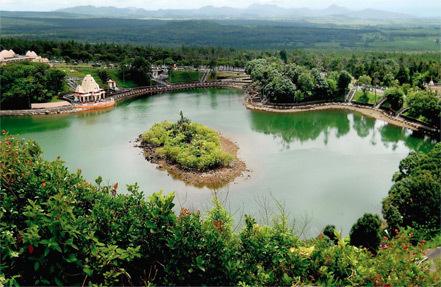 The lake is surrounded by a vibrant lush vegetations and forests encompassed by the incredible temples dedicated for various Hindu pantheon such as Durga, Parvati, Buddha, Ganesh, Saraswati, Vishnu, and so on. You will likely spot the huge Shiv statue which is of 33 meters, making it the highest statue in Mauritius. It is recommended to visit the Crater Lake in the month of February or March during the Maha Shivaratree Festival where you will have the chance to experience the religious ambiance, along with vegetarian food, devotional music and songs. One of the most fascinating spot to discover while visiting Mauritius is the Seven Coloured Earth located in Chamarel. This area has strikingly bare landscape showing well-developed rills and various shades of red, brown, grey, and purple. Engulfed by a large dense forest, the colours of the earth dunes are due to weathering of the basalt and the formation of secondary iron oxides and hydroxides in it, and the rilling is a result of deforestation and sheet erosion. This is due to the human modiﬁcation of the landscape. Such features also occur in Papua New Guinea, and may be common in tropical, high-rainfall regions with volcanic bedrock. And one fun fact is that if you mix the colored earth together, they'll eventually settle into separate layers. The dunes are protected by a wooden fence and visitors are not allowed to climb on them, although they can look at the scenery from observation outposts placed along the fence. Curio shops in the area sell small test-tubes filled up with the coloured earths. On the premises, you will also find a children's playground and some giant tortoises. La Vallée des Couleurs reserve invites nature lovers to taste the world of the glorious flora and fauna of the Southern part of Mauritius. Amidst a lush green vegetation with green houses, deer park, verdant valleys, endemic trees, wonderful ponds and rivers, not to mention the Seven Coloured Earth-the Vallée des Couleurs is a blissful exploration to rejuvenate your spirit. A visit of the Vallée des Couleurs brings pleasure to all your senses. The songs of birds and the sound of water falling are music to the ears and the captivating and breathtaking panoramic views of the South Coast is a pure delight for the eyes. The reserve is also a great place to enjoy selection of nature trips and fun activities. Additionally, there is an Exhibition room which provides an outline of the different places of interest which you will discover through your visit. You will also enjoy the visit the fern garden, which includes a plethora of flowers without which any visit in the park would be incomplete. The unspoiled beauty of the land captures every heart and soul. The park is also home to tortoises, monkeys, stags, fish and also birds such as the Pink Pigeon, Paille en Queue, Cateau Vert with various endemic trees like the Ebony, Bois de Natte, Takamaka and other rare plants also contributing to the beauty of the park. Enjoy the spellbinding four waterfalls such as the Cascade Vacoas, Cascade Bois de Natte, Cascade Cheveux d'Ange and Cascade Chamouzé where you can get to listen to the rustling water; relax in natural intimacy and feel inner peace. The park also offers a captivating and breathtaking panoramic view of the South Coast. Nestled in the heart of the fertile Chamarel Valley, the Rhumerie de Chamarel Distellery invites you for an all-encompassing tourism experience ranging from a guided visit of the distillery and rum tasting to a tasty meal at L’Alchimiste, its own stylish and creative “A la Carte” restaurant. The site is surrounded by vast sugarcane plantations growing in harmony with the pineapples and other tropical fruits nearby. The distillery was designed in order to provide a holistic tourism experience to guests. As a visitor of the Rum Distillery you can marvel at its unique design which blends harmoniously with the spectacular surroundings where wood, natural stone and water provide a sense of communion with nature. Discover the making process of the high quality and eco-friendly Mauritian rum where you will get to witness from growing, harvesting, to the fermentation and sophisticated distilling process. All is done so that the distillery can pride itself on the quality of its rum, achieved by distilling the fresh, fermented cane juice rather than that obtained from molasses. There are guided tours with the experienced guides who will take you behind the scenes to provide a detailed explanation of the rum making process while you visit the distillery. For your maximum convenience the Rhumerie de Chamarel distillery tour is done in either English or French at the duration of the tour is of about 30 to 40 minutes. 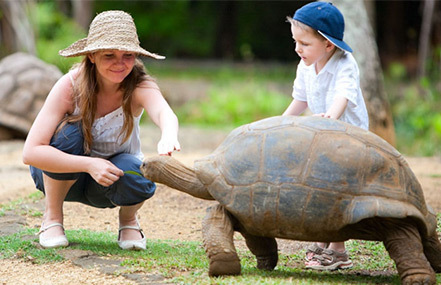 While exploring the Southern part of Mauritius, a visit to the Crocodile and Giant Tortoises Nature Park is a must. The nature park is home to the second largest crocodilian and one of the largest tortoises in the world. It is a picturesque and idyllic nature reserve located at Riviere des Anguilles in the south. It extends across 3.5 hectares, full of luxuriant vegetation consisting of beautiful palm trees, banana plants, giant bamboo trees and other gorgeous shrubs-reflecting a tropical rainforest setting. Also, there is also a “Jungle Adventure Playground”, which is an area offering fun attractions and activities, especially designed for children. Additionally, there is an insectariums and a museum to learn more about different animal species. Get a taste of the colonial era of the 19th century Saint Aubin House located at Riviere des Anguilles in the Southern part of Mauritius. Saint Aubin was precisely built in 1819 which was home to several managers of the Saint Aubin sugar estate, and eventually it was renovated in the 90’s to preserve the Mauritian heritage. The estate takes its name from one of its first owners, Pierre de Saint Aubin. On Saint Aubin estate, a small manufacturing unit has been rebuilt around the ancient sugar mill chimney which stands as a testimony to the past. The mill has been turned into a live eco museum where locals and tourists alike can observe all the manufacturing stages of the sugar milling process. 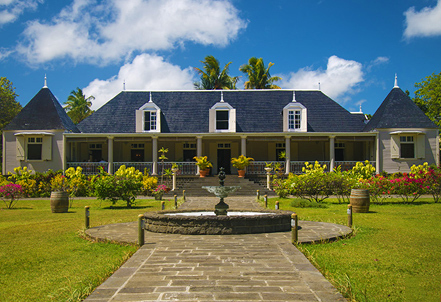 The estate has its own sugar cane plantations which lie along the undulating slopes of southern Mauritius. The fields of Saint Aubin have been under sugar cane cultivation since 1819. Driven by an enduring quest for uncompromising quality, Saint Aubin plantation has brilliantly met the challenge of reconciling innovation, tradition, human dimension and environmental protection. A visit to the Saint Aubin House consists of a guided tour around the estate where you will have the privilege to visit the Rum House where high quality rum is made; a visit to the Vanilla House where you will discover the interesting transformation process of the vanilla orchid from the flower to the aromatic pod; a visit to the Anthurium (flowers) greenhouses, and also a leisurely stroll in the tropical garden. The estate is also composed of an elegant colonial residence, a restaurant offering local Creole cuisine, and the Inn which is a typical traditional Creole house with an iron sheeting roof resting on exposed timber beams, teak wood flooring and ancient furniture. To make it more enticing, the Tea Route which is a gastronomical and cultural tour bears testimony to the different facets of the once colonial Mauritius and its traditional lifestyle. Discover the other side of Mauritius through a visit to one of the oldest tea plantation located in the highlands South of the island at about 500 meters in a cold region. The location serves as an ideal location for the plantation of tea, and offers scenic luxuriant green landscapes. Dating back to the 1890s, this lush tea plantation is best discovered on foot and offers not only a visual richness but also a flavourful richness of the senses. Bois Chéri has enabled the development of a true culture and tradition of tea in Mauritius. Its factory now produces more than half of the island’s tea. Attached to the Saint-Aubin Group, Bois Chéri is now part of the famous Tea Route. It allows a guided tour of the tea factory as well as the tea museum. A guided tour to the plantation generally takes around 1 to 2 hours and includes a tour to the Bois Chéri tea factory, visit to the museum and tea plantation, also tea tasting at the chalet. 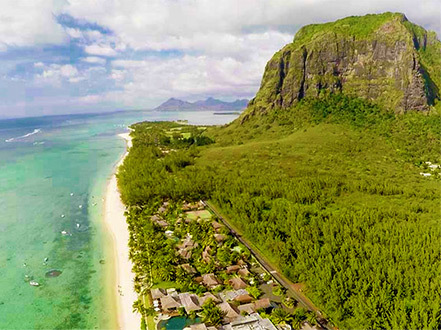 The symbolic Le Morne Brabant is a majestic mountain located in the South Western part of Mauritius, on the Le Morne peninsula. 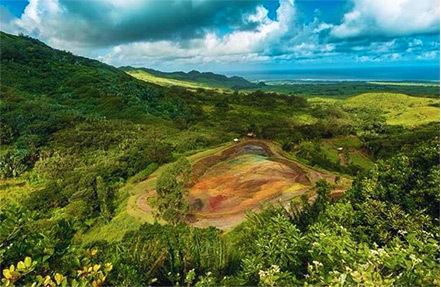 The majestic mountain has been declared as a World Heritage site by the UNESCO since July 6, 2008 to commemorate the Maroonage (runaway slaves) legacy in Mauritius. It is believed that the slaves were jumping off the cliff of the mountain to commit suicide due to the very inhumane treatment they suffered. Le Morne Brabant is one of the most preserved and wildest mountains of the island. It is habitat to a very large variety of endemic and narrow-endemic species, such as the rare Trochetia Boutonania, which is our floral emblem. The summit of the mountain covers an area of over 12 hectares (30 acres),and is about 556m above the sea level. There are many caves and overhangs on the steep slopes. It is largely surrounded by a lagoon and is a well known tourist attraction. Do not miss the breath-taking views of the west and south-western side by a hiking trail which approximately lasts for three to four hours. Rochester Falls is one of the spectacular waterfalls of Mauritius situated in the Savanne district of Mauritius. The waterfall forms part of the Savanne River which is at an elevation of 152 meters above sea level, approximately 2.5 km from Souillac (the capital of the Savanne district), and it tumbles from a height of about 10 m (33 ft). It is regarded as a popular tourist attraction due to its lava cliffs: years and years of erosion has led to the formation of a spectacular backdrop of rectangular blocks stuck together. The view of the waterfall is just spellbinding which makes it so enticing. The white water crashing down the rocky cliffs into a pool of crystal clear water, with the lush verdant vegetations in the form of ferns crawling up the smoother parts of the cliffs, and the trees around the river banks make it a perfect location to revitalize your spirit. The place is ideal to spend a picnic and to enjoy the serene atmosphere with the sounds of the falling water and happy chirping of birds. The Black River Gorge National Park is the largest protected area of Mauritius. It extends over 6,754 hectares that is 2 % of rolling hills and thick native forest of the South Western part of the island. Famous for its waterfalls, vistas and hiking, the gorge is in the central highlands, making it cooler than much of the island. The nature park has over 50 km of trails where you can explore the exquisite natural beauty of this part of the island. Find the spellbinding waterfall, pristine river, picnic areas, wide canyon, and dramatic mountain ranges, which create panoramic views altogether. There are approximately 311 of native flowering plants, and nine endemic species of bird, with a population of giant fruit bats. Some endangered bird species include the Mauritius kestrel, the echo parakeet, the pink pigeon, Mauritian flying fox, Mauritius bulbul, and Mauritius olive white-eye. You might also find the introduced wild boar, macaque monkeys, and deers wandering in the wild nature.